Lately I find myself falling into the arms of trust more and more often. It is one of the major themes of my life and a word I repeat to myself daily. The more I allow myself to be supported, buoyed by the word and the belief behind it, the more deeply I can breathe. 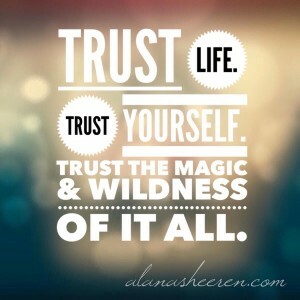 When I remember to trust, my body unclenches. When I remember to trust, my patience increases. When I remember to trust, my heart opens wider, able to see the good and the beauty of this world more easily. As I walk into my week this is the word knocking at the door of my consciousness, demanding to be heard. Trust life. Trust yourself. Trust the magic and wildness of it all. I invite you to journey with me into the heart of trust this week. If you have questions to ask, stories to share or simply wish for a virtual hand to hold, I’m here, walking beside you. P.S. If you’re looking to deepen your capacity to trust, the art and words of my amazing friend Kristin Noelle have been created to do just that. Her Healing Waves in particular are a beautiful and deceptively simple way to deepen this trust practice. The next wave, I Choose (Authentic) Joy begins June 10th. The other waves, Softening, Centering, Opening and Blessings are available to begin at any time. Click here to visit her soul nourishing site.